Y es, normally I review adult fiction and this is a middle-grade fantasy novel. But some of my favourite books are for kids and don’t lie, some of yours are too. You can skip this review but you'd miss out on one of the most delightful kids books I've read in a while. Anyway, is it even possible to read the title of this book and not smile in anticipation? And when you start reading, the young heroine, Peasprout, doesn’t let you down. Her voice is as cocky and self-confident as the title. 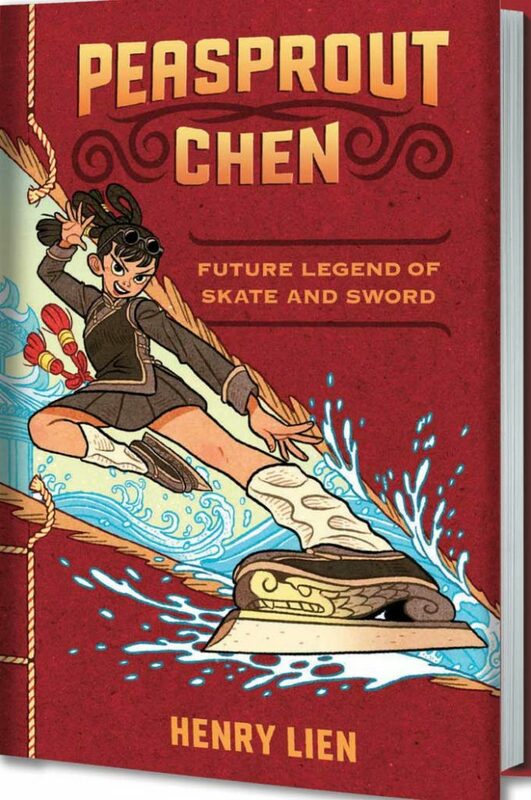 Peasprout Chen and her younger brother Cricket arrive in the city of Pearl, sent by the Empress Dowager of Shin as a gesture of goodwill, to study at the Pearl Famous Academy of Skate and Sword. Henry Lien’s Empire of Shin echoes of medieval China and Japan with its names and elaborate titles, the culture of reverence for teachers and elders, ornate public architecture, and houses with sliding shoji doors. And from there this wildly imaginative fantasy world springs into high gear. The city of Pearl, its streets and buildings, are made from an ice-like substance called pearl. To get around, its residents skate through the dazzling white city. The Pearl Famous Academy of Skate and Sword teaches the art of wu liu, a cross between martial arts and ice skating. Peasprout, a teenage star of wu liu in her own home, never doubts that she will win top honors at the Academy. Whether she’ll win any friends is another matter. When acts of vandalism start destroying the beautiful buildings of the Academy, a gossiping rival student tries to blame these crimes on Peasprout, the outsider. At the same time, there are rumors that the two Pearlian boy dancers sent to the Empress Dowager’s court are being tortured to force Pearl to give up the secret of making pearl. And Peasprout begins doubting what she’s been told all her life about her country’s history, about why she and Cricket were picked to come to Pearl. But she also needs to clear her name by finding out who is really behind the vandalism. It’s a novel that could fall into the clichés of boarding school coming-of-age stories, but Peasprout’s personality and the complex undercurrents both inside and outside the Academy ensure this never happens. Shunned by classmates who think she is a Shin spy, she responds by leaping and spinning her way to win each competition, spurred on by her determination to represent Shin with glory. Her self-esteem is apparently boundless. Until she realizes she might be just an expendable pawn. There’s a masterful balancing act in the way Lien has built his world. There are enough hints and references to anchor you in Asian history so that you can grasp the societal norms of this fantasy country. But the clues also keep you guessing – it adds to the novel’s allure when you wonder if Pearl City’s Aroma Bay could be the stand-in for Fragrant Harbour (the Chinese name for Hong Kong). And the Pearlians seem to have cordial relations with the Empire of Eda – surely a stand-in for Japan, which once held Taiwan as a colony. I love Henry Lien’s imagination and humour. I love the way his characters curse: ten thousand years of stomach gas and piss me off to death – that second one a translation of one of the few Chinese colloquialisms I actually use. He makes me want to know about the history of bad blood between the city of Pearl and the Shin Empire. And having spent my teenage years as an ungrateful daughter, I definitely want to know more about the Pearl Rehabilitative Colony for Ungrateful Daughters. From the swooping, leaping wu liu competitions to the plot twists at the end, this page-turner delivers an unforgettable world, bold characters, a great story, and lots of fun. What grown up could ask for more? It’s been a while since I wrote a book review. One of the things I do in reviews is discuss something I’ve learned about the craft of writing as a result of reading the book. I think there is always something you can learn from a good author, no matter what genre. What stands out for me is Peasprout’s voice. The story is narrated in the first person by Peasprout, so her voice is the voice that carries the story, and it’s unforgettable. In the beginning, we are inside the head of a teenager who has yet to deal with serious failure. She’s purposeful and self-important. Her job at the Academy to uphold the honour of Shin while looking after her brother Cricket. Yet there’s insecurity seeping through that self-assured voice, the realization that Pearlians consider Shin a backwards place, that she might not be the most talented wu liu student in her class, and that she may never gain the acceptance of her fellow students. When she makes mistakes, it’s bravado that braces her tough façade. But you can’t deny her courage or her generosity. There’s so much intrigue and action in the story and Lien is so skillful it’s easy to overlook how deftly Peasprout’s voice shows her gaining in compassion even as she loses faith in her Empire. When a novel is written in the first person, that point of view must carry both the narrative arc of the story as well as the protagonist’s own character development. I know this. But for some reason, Peasprout really brought this lesson home for me. When writing in first person from now on, I will remind myself to pay more attention to voice, to find ways to make it more distinctive and to use it more effectively as a way to signal change in the character’s mindset. Next week: an interview with Henry Lien, author of Peasprout Chen!